Enhance your body’s natural glow with the PAYOT Brume Sublimante Élixir - Moisturising Tanning Care, a nourishing, gradual tan that reveals soft and luminous skin. 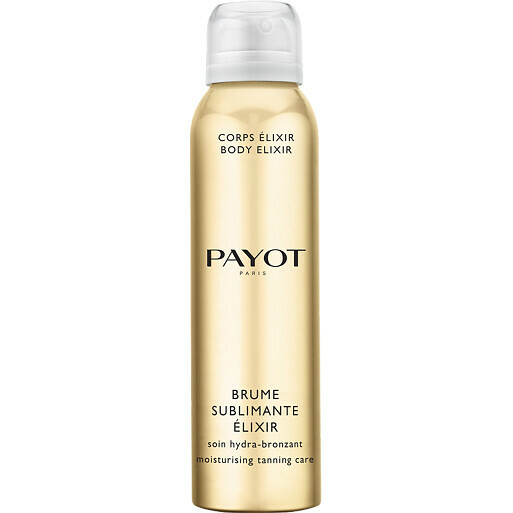 The PAYOT Brume Sublimante Élixir - Moisturising Tanning Care delivers a gradual, light tan that is buildable and long-lasting. Easy to apply, its light mist features black rose extract to moisturise your body, creating a streak-free finish with a gorgeous, natural glow. Spray over the entire body from a distance of around 40cm and leave to dry without spreading. Repeat the application until you reach the desired level of tan. AQUA (WATER), BUTYLENE GLYCOL, GLYCERIN, DIHYDROXYACETONE, ERYTHRULOSE, ROSA HYBRID FLOWER EXTRACT, PPG-26-BUTETH-26, PEG-40 HYDROGENATED CASTOR OIL, BENZYL SALICYLATE, SODIUM BENZOATE, POTASSIUM SORBATE, CITRIC ACID, PHENOXYETHANOL, PARFUM (FRAGRANCE), LINALOOL, HEXYL CINNAMAL, HYDROXYCITRONELLAL, LIMONENE, CITRONELLOL, GERANIOL.